It looks like Apple is looking forward to kill the 3D Touch pressure-sensing display feature from all 2019 iPhone models with an OLED screen. According to Barclays analysts in their research note to investors, a copy of which was obtained by MacRumors, that it’s “widely understood” among key supply chain players that 3D Touch will be removed from all OLED iPhones to be released in 2019. This includes a third-generation 5.8-inch iPhone X and a second-generation 6.5-inch iPhone X Plus. The analysts caution the plans aren’t finalized yet so they could change. The prediction is based on the information that Barclays analysts gathered during their recent tour key Asian companies within Apple’s supply chain. 3D Touch hasn’t fulfilled its full potential, but it’s not clear why Apple would remove this feature while continuing to spend resources on enhancing iOS’s software features that use 3D Touch. 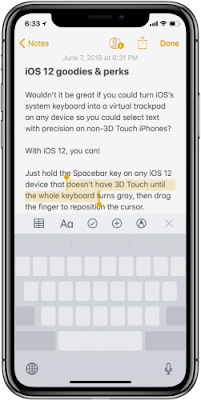 The clearest indication that Apple might in fact be prepping to remove 3D Touch hardware from the entire iPhone lineup is a new feature in iOS 12 that lets owners of non-3D Touch phones to tap and hold the Space bar to enter the virtual trackpad mode. Removing the 3D Touch feature would also allow Apple to earn a bit more money per each iPhone sold because a layer of 96 pressure-sensing sensors between the display and the backlit module doesn’t come cheap, plus it adds weight and increases display thickness. So are you with removing 3D Touch from next generations of iPhones or not?